The rapid growth of technology has transformed many brick-and-mortar businesses into online businesses, and medicines are now being sold over the internet. Influenced by the notions that online purchases are economical and do not require a prescription, the general public are keen to purchase medicine online through websites, social media and mobile apps. Online medicine purchase is presumed to be convenient and confidential, free from embarrassment of sharing personal and sensitive health information to a healthcare professional. Public in United States, Europe, Australia is generally aware that internet sales form part of the official medicines distribution channels, often a valid prescription is required for controlled medicine. 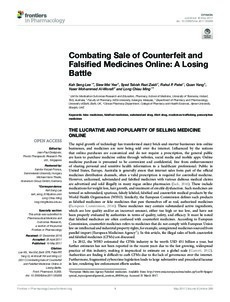 However, unlicensed, substandard and falsified medicines with various dubious medical claims are advertised and sold illegally in many rogue online pharmacies (Jack, 2016). These include medications for weight loss, hair growth, and treatment of erectile dysfunction. Such medicines are termed as substandard, spurious, falsely labeled, falsified and counterfeit medical products by the World Health Organisation (WHO). Similarly, the European Commission defines such products as falsified medicines or fake medicines that pass themselves off as real, authorized medicines (European Commission, 2016). These medicines may contain substandard active ingredients, which are low quality and/or an incorrect amount, either too high or too low, and have not been properly evaluated by authorities in terms of quality, safety, and efficacy. It must be noted that falsified medicines are often confused with counterfeit medicines. According to European Commission, counterfeit medicines refers to medicines that do not comply with European Union law on intellectual and industrial property rights, for example, unregistered medicines sourced from parallel import (European Medicines Agency). In this article, the illegal sales of both counterfeit and falsified medicines (CFMs) are discussed. In 2012, the WHO estimated the CFMs industry to be worth USD 431 billion a year, but further estimates has not been reported in the recent years due to the fast growing, widespread practice of this industry, making it impractical to estimate on a global scale (Garrett, 2012). Authorities are finding it difficult to curb CFMs due to the lack of governance over the internet. Furthermore, fragmented cybercrime legislation leads to large substantive and procedural lacunae in law, rendering law enforcement efforts useless.